Industrial coolers and freezers are often implemented in a warehouse for storage of food, medicine, or any number of other items. In these cases, the next step after integrating the industrial cooler or industrial freezer is often sourcing a racking system to be installed inside. If you’re currently researching options for an industrial cooler or industrial freezer for your warehouse, consider combining both of these steps by implementing a rack supported cooler or freezer. Integrating a rack supported structure for an industrial cooler or industrial freezer offers higher storage density because the system will serve as the structural base. This eliminates columns or any other structural obstructions, allowing optimal space utilization. In addition to higher density, combining the storage system and framework reduces costs and building time. Since both structures are constructed simultaneously, the timeline is often shorter, allowing operations to resume quicker. 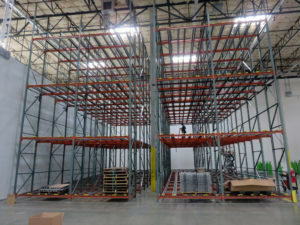 Rack supported structures can be worked into an existing warehouse design without building modifications. How Does Rack Support a Cooler or Freezer? The first step is to construct the rack. In order for the rack to support a cooler or freezer structure, including compressors and coils, rack frames are extended to the height of what will be the ceiling and includes support beams and brace beams above the storage. Depending on the application, it can also require added structural mono posts and cross channels. Once the rack structure is fully installed, the walls are anchored to the floor. The ceiling panels are then secured to the top of the racking. Coils for temperature control are also secured around the rack. Industrial cooler or industrial freezers can be supported with drive-in rack, push back rack or selective rack storage systems. Each of these have unique attributes that make them ideal for different storage applications. Choosing the one that fits your product flow and characteristics of the inventory to be stored inside will ensure that your operation is at maximum efficiency. Drive-in rack offers high density and provides excellent space utilization. 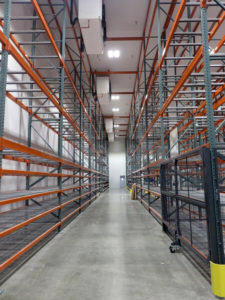 It eliminates the need for multiple aisles, helping to reduce overall square footage requirements. One aisle is eliminated so products are only accessible via one end of the system. This lowers the selectivity but increases the density. Push back rack is ideal for cold storage facilities that require access to multiple groups of SKUs simultaneously. The rack supports carts that move along inclined rails. Product is loaded from the front of the system. Once the product is taken from the front cart, the next one moves forward. Selective pallet rack is ideal for industrial cooler or freezer applications that require continuous product circulation. In these systems, pallets are loaded and unloaded from the front enabling direct access to all stored pallets or cartons. This system is suitable for food and beverage distribution as it allows for constant product movement, safeguarding that no inventory spoils or goes to waste. Are you considering an industrial cooler or industrial freezer for your cold storage operation? As a full-service provider of storage solutions, REB Storage Systems International can provide you with a rack supported industrial cooler or freezer for your warehouse. Through our project management services, we’ll manage your project from conception to completion, including designing the structure, sourcing materials, installation, and permitting support. If you’d like to find out if a rack supported industrial cooler or freezer is ideal for your facility, fill in the contact form or call (800) 252-5955.